Nine Mile Creek is a bluegrass band playing traditional and original bluegrass, with a touch of swing. Long time fans of the bluegrass genre and those appreciating the joys of good acoustic music are embracing Nine Mile Creek’s fresh approach. Full-on up tempo rhythms underpinned by Andrew’s bass and Doug’s guitar are a feature of the band’s sound. This provides a platform from where Mark’s hard driving mandolin and Colin’s banjo brings traditional bluegrass tunes to life. Lead vocal duties are shared, and two, three and four part harmonies make for an exciting, toe-tapping musical experience. Mark Pottenger and Andrew Barcham were keen to continue the experience they’d had playing in previous bands, and with Colin Weight on banjo, formed a trio that performed at the Kelly Country Pick in 2012. Since then, they’ve played with a couple of great guitar players, and Doug Wallace joined the band in early 2016. 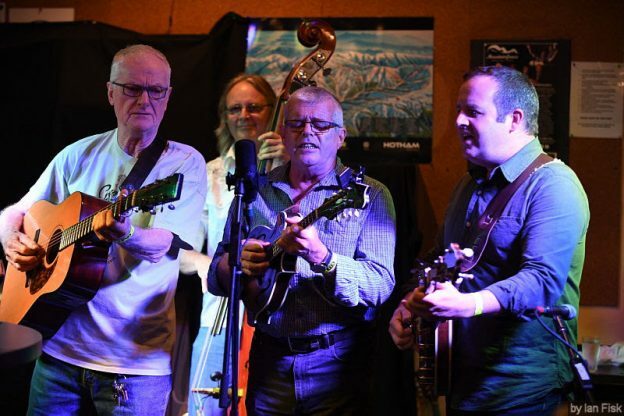 The band has a strong repertoire and is a regular contributor to the Mountain Pickers Association’s monthly night at the foot of the Dandenong ranges. They regularly feature at Australian bluegrass festivals, including Mountaingrass, Kelly Country Pick and the Foggy Mountain Bluegrass festival. They also perform at non-bluegrass events, introducing the joys of bluegrass music to enthused audiences!